Have you given SEO writing a shot, and it didn’t go anywhere? You didn’t notice your rankings increase or any organic traffic roll in. 45% of businesses plan to increase their SEO budget, but many struggle to pull it off properly. I’m going to help you solve that problem today. 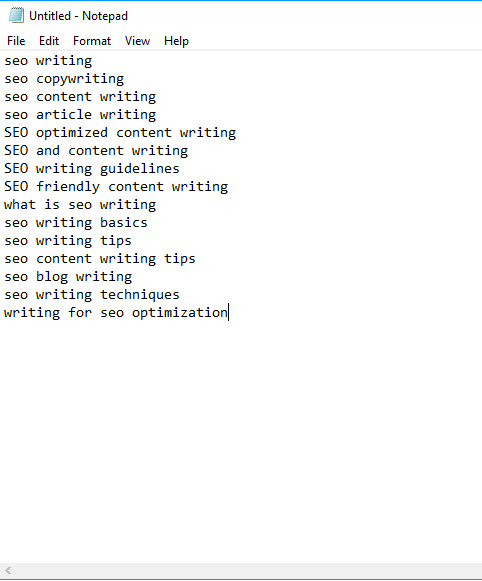 Ahead you’re going to learn some SEO writing guidelines that I use myself to drive massive traffic to websites. They’re simple and take very little time. Crack your knuckles and enjoy! SEO article writing is the practice of producing content or copy that also has the goal of improving a websites SEO to drive organic traffic. Many websites write blog posts, white papers, case studies, or other material without a proper SEO blueprint, and are missing out on great opportunities. Some simple techniques could be turning your content into an SEO powerhouse that generates you leads and customers without lifting a finger. Content with an SEO focus not only helps drive more traffic to your website, but also targets specific types of users through exact search phrases. Look at Seige Media for example. 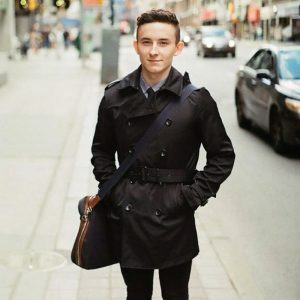 Marketer Andrew Dennis grew them from zero to 100,000 visitors in one year with good SEO. And, do you know what one of their keys to success was? The goal was to create content that appealed to Seige Media’s target audience, while also capturing natural links and attention to the site. They used tools like SEMrush to narrow down search phrases that had less competition or could be easily beat, and built epic posts around them. Now that you’re hyped up to learn SEO copywriting, let’s get into the first step. You can’t do SEO without keywords. That’s why the first step before you write any piece of SEO content is to research phrases. There’s tons of tools to do this: Google’s Keyword Planner, KWFinder, SEMrush, etc. 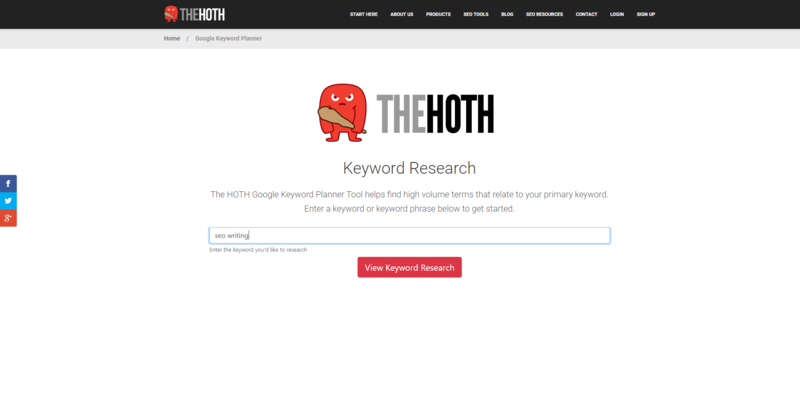 I’m going to use HOTH’s keyword research tool because I’ve never tried it out before. This will generate search volume, CPC, number of results, and competition for the term you entered. They also list tons of similar search phrases that you can use to put together a hitlist. Every time you write a piece of content, you want to target a main keyword and several secondary ones. Don’t be afraid to target high competition keywords, either. You’d be surprised how much traffic they can rack in, even if you don’t rank highly. I recommend keeping a notepad file or spreadsheet of your keywords, so you don’t need to keep any tools open while you write. It also helps you stay organized and you can tab into it to get more ideas of keywords you can add to your content. You might have the question, “Where do I put keywords?” and you’ll be learning that in the sections below. Did you know that eight out of ten people only read the headlines of articles? That means only two people on average will click through to read your content. It’s more important than ever to write exciting and interesting titles, or you’ll be lost in the crowd of average SEO blog posts. Furthermore, how many people click your search engine listing is a big ranking factor. Google introduced in an interesting algorithm update a few years ago called RankBrain, and it was nothing like we had ever seen before. Unlike other updates that focused on how links rank our site and metrics we’re used to, this algorithm change put more emphasis on user experience. It tracks stats like bounce rate, click through rate, and average time spent on page. If your popping up on the first or second page of Google, but users aren’t clicking your site, what does that tell the search engine? Most likely that you’re not as important as other sites, pushing you further down the ranking ladder. With that being said, here are four tried and true ways to craft excellent headlines that take clicks away from the competition. I learned these techniques from a fantastic book called The Copy Writer’s Handbook by Robert W. Bly. Give it a read to learn more copywriting tactics if you’re in need of a new book. 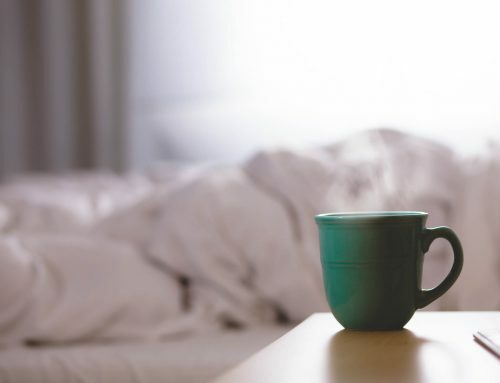 Fear of missing out, or FOMO for short, is a serious human phenomena. It’s the idea that we don’t want to miss out on something great, thus we feel urgent to take action. You can use this psychology to your advantage. Here’s an example of it being used in real time. This title is great because the words “Don’t miss out” not only implies that the reader will lose out by not clicking through, but it’s also a call to action. Try mixing headling techniques like this together to create a recipe for success. No one is going to click a title that doesn’t explain exactly what the content is going to cover or teach them. Look how Moz uses this strategy to their advantage on the homepage of their website. Instead of saying something general about SEO, they use an interesting number that catches your attention. And, guess what? They use a call to action! It’s not a surprise that the biggest companies are all using these techniques. It’s because they work. There’s no shortage of boring and useless content on the internet these days. People are pushing out blog posts and videos that are just rehashed pieces of what’s already out there. That’s why crafting a title that implies why your content is more useful than others is crucial. It tells readers what they’re going to learn, and is useful. You need to separate yourself from the pack. If you use titles that everyone else has, you don’t appear any different. That’s why you need to take the time to research your competition, and create a headline that jumps from the page. You would visit Google, type in that phrase, and study the titles you see. Brainstorm title ideas that would stand out among the results you see. Alternatively, you can save competitors headlines and use them for inspiration later. That’s also known as a swipe file. When Google sends crawlers to your website to determine what it’s about, every little detail matters. You need to set the foundation, lay the bricks, create the frame, and it all comes together at the end. That’s how SEO writing works, too. One of the easiest optimization fixes is making simple and friendly URLs. I recommend adding your main keyword to the URL, as well. Here are two good examples of this. If you use WordPress, or any CMS for that matter, some times permalinks can be set to have a strange structure. This will negatively impact SEO and the user experience. Choose the custom or post name option. With keywords in hand, and a solid title, let’s move onto more SEO writing basics. The amount of words you write will heavily impact your rankings. In the past, you could get away writing 500 to 800 word articles, and call it a day. You need to be writing at least 1,890 words according to a Moz study that concluded the average #1 position on Google is that length. It packs more value for the reader, which is ultimately what search engines want. It increases average time spent on page, telling Google that your website is useful. It naturally attracts backlinks because it’s a better resource for other webmasters to link to. 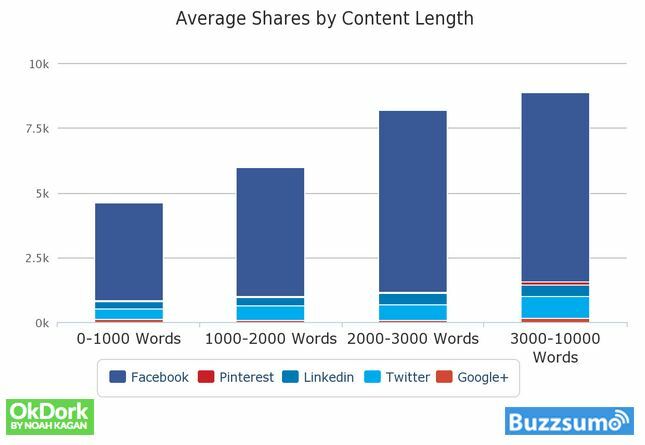 OkDork and BuzzSumo also performed a study where they found that higher word count led to more social shares. If you visit a lot of the top websites that use content marketing, you’ll notice a trend. And, that is they commonly shoot for 3,000 words for their articles. This is above what a lot of data says right now, putting them ahead of the curve. I know it can be daunting to write thousands of words, but be patient. The hard work pays off. I suggest not raising word count for the sake of it. That’s how you get fluff. Only include sections and content that add value. Users and Google will see right through it, otherwise. Back in the day, marketers use to stuff their blog posts with keywords and Google didn’t know any better. They would rank on the first page with little to no effort. It’s no longer like that, though. You need to be strategic about where you place search phrases, and how often. Have you ever read a piece of content and it was just blocks of text? I don’t know about you, but there’s no way to get me clicking back to Google faster than articles that aren’t formatted. In fact, 43% of people admit that they only skim blog posts to find what they want. Think about your own behavior. Do you read word for word, or scroll through and narrow down exactly what you’re looking for? Formatting your content keeps people longer on your website and pleases Google at the same time. It’s easy, too. The first thing I recommend is keeping your sentences short. Have you noticed through out this post that my paragraphs don’t go longer than a single sentence usually? Some times they’re just a few words. It’s easier to digest and allows you to elaborate on one idea at a time. Secondly, use headers to break your content into bite sized chunks. Users can scroll through and find the information they’re after much easier. It also makes intimidating topics or long form content less scary, as readers can take it step by step. Thirdly, lists and bullet points can help summarize information or lay out information in a simple format. And lastly, ensure that you also add images and videos to accompany your SEO writing. It will make it more interesting, visually appealing, and adds more resources for readers to learn from. 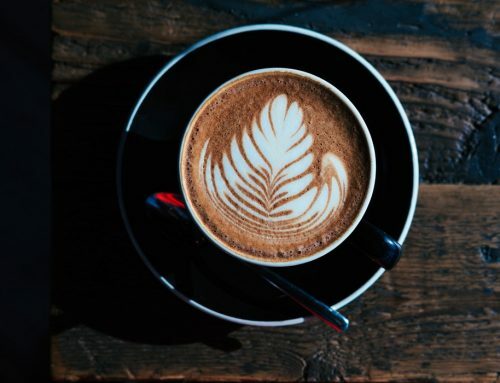 32% of marketers agree that images are the most important element of content marketing. However, images can slow down your website when they aren’t optimized. They also are often the subject to SEO negligence. I’ve seen countless websites that don’t optimize their photos from search engines, and it’s a shame. It’s such an easy win. Here’s how to do it yourself. You can reduce the file size of images to speed up your website, which will effectively boost your SEO. Don’t create content, for yourself or for clients, that has bulky images. It’s a recipe for disaster. 46% of users dislike when a website takes long to load, specifically on mobile, as well. Try using the free tool Compress JPEG to get around this. Click “Upload files” and choose any pictures you want compressed. This tool will greatly reduce how big the file size. You can download them individually or in bulk afterwards. Now that your images won’t slow down your content, it’s time for the next step. Follow along. Both the file name and alt text are important for your SEO. Google scans both of these to determine what an image is about, and alt text specifically helps visually impaired users. 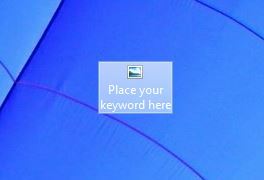 File names can be changed by right clicking it and typing in a new name. Enter a keyword here if possible. Editing the alt text is a little different. This will depend on which CMS you use to upload images to begin with. For example, I’m on WordPress. When I upload an image, I can change the alt text right from the media window. Adding links through your SEO article writing process is crucial for a couple of reasons. Firstly, internal links pass SEO juice further down into your website. Furthermore, it keeps users longer on your website, reducing bounce rate and increasing average time spent on page. As you learned earlier, these UX based metrics help rank you higher on Google. You’ll want to engineer the anchor text, too. 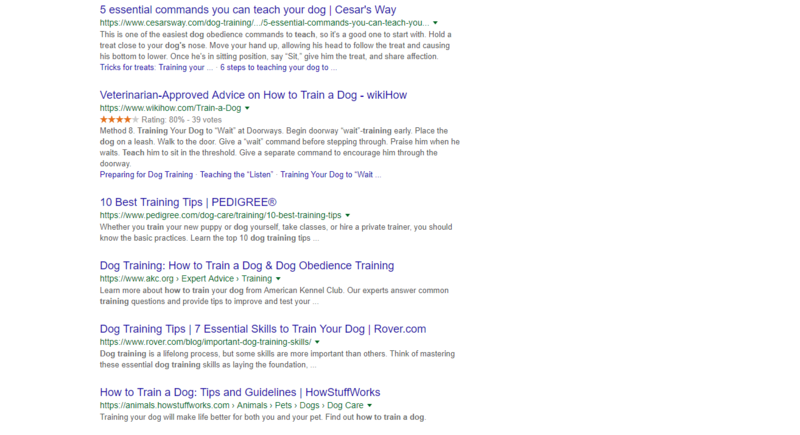 You can increase your rankings for certain search phrases by using them as the linking text. However, don’t abuse this. The algorithm is smarter than you think, so switch up the anchor text. Similarly, external links to authority websites gives readers more resources to work with. Google has denied that they use it as a ranking factor, though. It’s a normal component of high quality content, nonetheless. Last, but not least is the meta description. It isn’t weighed as heavily as it used to be in the past, but here’s something you need to know. The meta description should be used to speak to a user’s needs, call them to take an action, and highlight keywords. Look at the below example. I searched Google for “How to build links” and this description would appeal to relevant readers, while also bolding text. It’s general practice to keep it around 150 to 160 characters, otherwise it gets shortened. That sums up how to write SEO articles! It’s a skill that every marketer should learn, as you can drive traffic to your blog or website without changing up much of the process. The first step is to research keywords for all content you write. These search phrases need to be placed within the title, URL, headers, file names, and alt text of images. When you begin writing, craft headlines that are urgent, useful, unique, and ultra specific. This gets more users clicking your search result, boosting rankings. Then, focus on word count. I like to go anywhere from 2,500 to 3,000 on average. Data shows that this is a good spot to hit. Use your keywords naturally and sparingly through the content, as well. Format it with headers, lists, images, and videos. Lastly, ensure that there are multiple internal and external links to pass SEO juice and provide more resources. I hope you enjoyed reading! So, start applying what you learned today and skyrocket your traffic.